This book provides the first modern systematic account of the English law relating to religious organizations. It introduces the subject through an historical overview of the relationship between church and state, and a depiction of contemporary patterns and structures of organized faith. It considers in depth the emerging human rights law of religious associations, the legal constitution of religious bodies, the status of ministers of religion and legalprivileges associated with public religion. 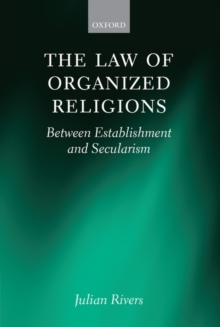 Subsequent chapters examine the legal regulation of major aspects of religious life, including rituals, faith-based education and the delivery of faith-based welfare services. The book also considers broader questions of the legal regulation of religion in public life, from access to public discourse through formal and informal governmental consultation processes to safeguarding the presence of religious voices in the regulated mass media. The final chapter draws together the author's reflections on trends at a broader level of constitutional theory. It argues that modern constitutional law occupies an uncertain position between establishment and secularism. While accepting a version of the secularization thesis in respect of English law, the author identifies but rejects legal secularism as a specific alternative to establishment. Instead, he argues for the clearer recognition of constitutional principles of autonomy andneutrality in the regulation of religious life. The principal focus of the book is the law as it applies to non-established religions, but comparative reference is made throughout to the position of the Church of England. It emphasises the recent historical development of the law as an essential key to understanding current controversies and possible future resolutions.